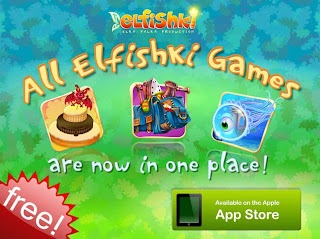 In this version, you you can enjoy the "Decorate the Cake" Game (fromElfishki and The Giant Cake Fairy Tale storybook). The other two games - "Help Jeanso Pack his Backpack" and "See I Spy" are available as In-App purchase. Get this Free iPad app HERE. These are great games for the kiddos! And a Bonus - "Decorate The Cake" game, which have been specifically adapted for the iPhone. disclosure~ this info was passed on to me from Elfishski!